Oh, am i tapdancing around the room or what!!!! I just caught that genius, Yuval Noah Harari in a misspelling. And what makes it even richer is that, to be precise, i just discovered that Harari and i shared the same misspelling. See, what happened is that while i was wallowing in fear and delight in his second book, Homo Deus, i read the word “Mitteleurope”, which i knew from studying German. However, i realized that my definition, that it referred to a region somewhere to the right of Germany, was imprecise, so i DuckDuckWent it to learn more. Their list of hits began with the line, “Including results for mitteleuropa.” Hmmmm. Then to my astonishment, the first hit on “Mitteleurope” was way down at the bottom of the first page, in an article from The Guardian. The next hit was on the second page, in an Amazon ad. I scrolled down a few more pages and found no more instances. It was virtually all to “Mitteleuropa”, most particularly the articles in German. Ha! What this suggests is that “europa” came into the vocabularies of me and Mr. Harari from an audible source and that we somehow, since the final letter sounds the same in German, misspelled “europa” as “europe”. But now i at least will never again misspell “Mitteleuropa”. THE SLOT: What Exactly Is a CopyEditor? I mean, folks, if you’re gonna put something out on the web to get people to look at your copy editing site, you really, really ought to spell everything right. Meanwhile, regarding the drugs reference, i can’t write on drugs even though the OCD quality of many of my posts would suggest that i’d been toking. However, i did take advantage of California’s legalization of marijuana last January, waiting a month to show i wasn’t a jonesing addict and then going to the closest outlet. It was a clean, well-lighted place with a vibe rather upscale for Mission Street, and the goods were displayed attractively. What i found absolutely delightful was the packaging. We’re not talking some bud stuffed into a small plastic bag. No no. This stuff is just plain marketed. I haven’t opened the jar containing my recent purchase yet, but a close examination through the glass shows that it contains five buds. Lotsa packaging for five buds. Here’s the new purchase beside the box the jar was in. Love the witty name for this variety. And yes, i had to Google “Durban Poison“. 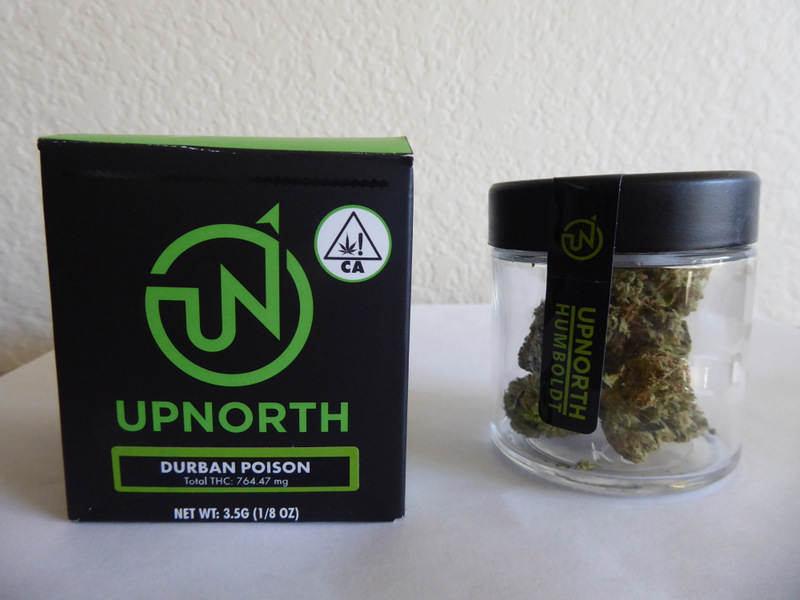 Not a pothead either but if it’s truly “Durban” it would have a lot of sativa/THC effects. Start slow. I have to laugh, but i’ve been too busy recently to try my new purchase, so i thank you for the warning. Great to hear from you! And sorry i’ve been so busy that i hadn’t checked in a week to see whether there were comments awaiting approval. My bad.